Thank you to the librarians who shared information about their programs and read drafts of this post: Tamara Marnell, Central Oregon Community College; Richenda Hawkins and Jane Sandberg, Linn-Benton Community College; Masyn Phoenix, Tillamook Bay Community College; Maria Wagner, Portland Community College; Niamh Wallace, University of Arizona; Ann Agee, San Jose State University; Naomi Moy, CSU Dominguez Hills; Liz Siler, UNC Charlotte. Library resources can be one way to lower textbook costs for students. They are high-quality resources that students already pay to access through their tuition and fees. This post explores several strategies that libraries can pursue to encourage the use of library content as course materials. There are three different audiences that are interested in this information: librarians, faculty, and students. The assumption behind this post is that readers work at libraries that use different ILSs, have varying levels of tech support and programming skills, and have varying levels of access to faculty and bookstore managers. The strategies suggested here don’t depend on any particular LMS being in use and can be adapted to fit your specific environment. If you try any of the ideas suggested here, I would love to hear from you. Please comment below or email Open Oregon to share your experience. But first, a word about an important stakeholder group – bookstore managers and staff. They see the impact of high textbook prices firsthand, every day. Often they are passionate advocates for affordability. Libraries will need to reach out to these partners and work collaboratively on any of the strategies described below. Steven Bell, Associate University Librarian for Research & Instructional Services at Temple University, has written about building relationships between libraries and college stores. 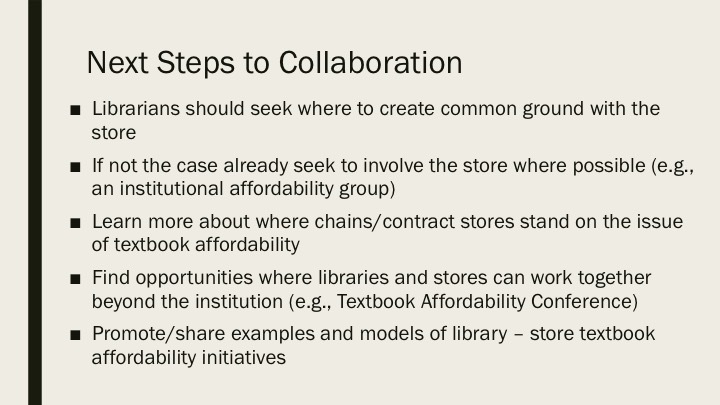 In a recent presentation at the Open Ed 2016 Conference, Bell reported on research findings showing that while librarians might worry about the bookstore’s reaction to textbook affordability projects (TAPs), bookstores are ready to collaborate on these efforts. 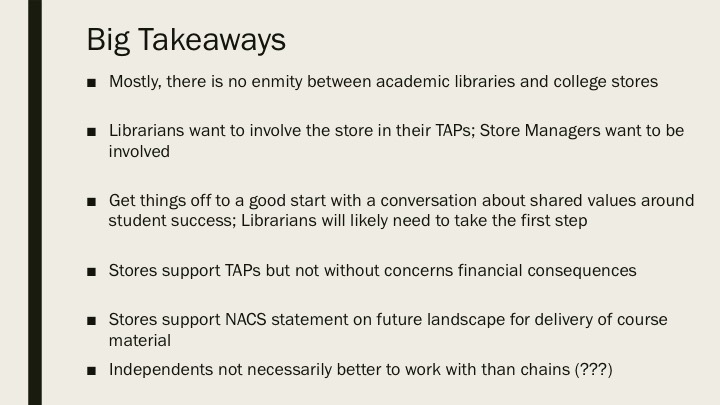 The slides below offer the takeaways from Bell’s survey and suggest next steps (note that these points apply to use of library resources or OER as course materials). Steven Bell, But What About The College Store? The Impact of Textbook Affordability Projects, http://sched.co/7lpP. Used with permission. Librarians can increase use of collections and save students money by comparing textbooks listed at the bookstore to electronic holdings. If faculty have adopted books that are already available as ebooks, students may be able to save money by avoiding a purchase. Librarian Richenda Hawkins described the significant student savings achieved at Linn-Benton Community College in her campus report, and it may be possible to automate some of the steps of this process. The first thing you will need is a data dump from the bookstore. Like libraries, bookstores use various systems that might provide partial bibliographic information, abbreviated titles, and other messy data that doesn’t lend itself to a simple search. ISBNs are likely to be the best identifier that the bookstore can provide. If the bookstore ISBNs don’t match the ones in your catalog, you may need to clean up your data using an ISBN resolver. You will also need to export the ISBNs for all ebooks in the catalog. How you do this depends on your ILS. Now you have a list of ISBNs from the bookstore that were selected by the faculty, and a list of ISBNs representing library ebook holdings. Microsoft has a support page explaining how to compare data in two columns to find duplicates in Excel. Where you do find a match, you will need to check the license on your ebook. In most cases, you will need perpetual access for unlimited simultaneous users in order for the ebook to work as a textbook. If the license isn’t appropriate to the need, it may be feasible to purchase the needed level of access. Where you don’t find a match, if you have available money for ebook purchases, you can repeat your search in GOBI. You can search multiple ISBNs at once in GOBI: under Search, select Add Titles by ISBN, and use the Enter ISBNs box. This option also exists for Proquest Coutts (formerly Ingram’s Academic division). Your [course name/number] textbook, [title of book], is available through the LBCC Library’s subscription to [database name]. Students can access this book several ways. First, here is a direct link to the book: [link]. Please provide this link to your students in your syllabus or on your website. If students lose that link, the book can also be found by searching in the LBCC Library catalog by book title, author, instructor name or course name. In addition, the book can be found by searching by title or author directly in our [database name] database. Please note that you must access [database name] from our library website: [link]. Finally, this book can be accessed from off-campus [instructions for off-campus access]. Here is a quick screencast that explains some of the features of [database name]: [link]. I would be happy to answer any questions you may have about accessing this book or about how to use these databases. In addition, librarians are available at the reference desk [days/hours]. A separate strategy that librarians can directly pursue is to review collection development policies that may discourage or prohibit acquiring textbooks. Does that policy truly meet student needs? Are the materials purchased instead used as frequently as course materials would be? Third, librarians can devote staff time to helping faculty change over from a copy center coursepack to using library materials instead. Students should not pay twice for copyright clearance and access. Faculty will almost certainly require help with going through their syllabus, figuring out where the library already has access to assigned content, and providing a persistent and proxied link to that content. This is labor-intensive work that requires planning to fit into existing library workloads. The section above surfaces library holdings of course materials that faculty have already adopted. Faculty-facing information is most useful at the point of selection – for example, faculty can search the library catalog (or discovery tool) with a format limiter to find available ebooks. The most important point to convey during faculty outreach about using library ebooks as course content is that they should not adopt library content without checking with a librarian first. It would be a communication nightmare for students to run into DRM, licensing, or print problems when the term is already under way. If faculty are interested in using an ebook that doesn’t have the appropriate license, a librarian can explore purchasing a different license or suggest an alternative. One way to mitigate this need is to provide a list that already filters for these issues by including only titles that the library owns or can purchase, and that meet the criteria of offering unlimited simultaneous user access, perpetual access and archival rights, and no DRM. It would be possible to modify catalog records so that ebook holdings that meet the criteria are marked as “textbook friendly.” Librarians can offer faculty a canned search on that tag. To summarize, directing faculty to search for all available ebooks in the catalog exposes faculty to the widest range of library resources, in the hope that they will communicate with librarians before adopting. Offering a filtered list may make the library’s holdings seem more limited but enable faculty to select from library holdings with less mediation, though they should still talk with a librarian. Where there is library coverage for textbook adoptions, you must communicate to students that the course materials are available online at the library. One important place to do this is the bookstore and its website, since this is where students expect to find their textbooks. Is your bookstore willing to provide students with the proxied link to the ebook? Can you talk to the faculty teaching those courses so that they can reinforce the message to students? University of Arizona, for example, embeds links to library ebooks in the course management system for relevant courses. Ebooks could be added to course reserve systems if librarians don’t have access to a content area in the course management system. These are two more places that students typically look for their course materials. The bookstore is usually the first stop for students looking for textbooks. But if you can’t get your holdings information listed there, or if you want to publicize your part in the textbook savings effort, you can provide the information via the library website. Students appreciate knowing how their tuition and fee money is spent, and that it has a direct impact on textbook savings. For example, San Jose State’s King Library maintains a page for Textbooks available as eBooks in the Library. The list has hundreds of entries each term and stats show hundreds of thousands of uses for this content. Likewise, CSU Dominguez Hills also has a Textbooks as Ebooks in the Library List. The database E-Textbooks at UNCC’s Atkins Library provides a browsable and searchable list that students can use to find their textbook at the library. Maintaining these lists provides excellent evidence of impact, but may be lower-priority than working with the bookstore to ensure that students are aware of library options at the point of purchase. Textbook affordability initiatives generate very persuasive data. You will be able to set goals and track number of adoptions, cost of previous textbook, student enrollment, and student savings. Please share what you learn – data helps make the case for library budgets, sustainable alternative textbook programs, and librarians as leaders on campus. When we talk about the problem of unaffordable textbooks, the solution is usually for faculty to consider switching from commercially published textbooks to open educational resources. Library resources, by contrast, are almost always under copyright restrictions, subject to a contract with a database provider, and password-protected. Further, students lose access to their logon and password when they separate from the college. On a related note, if database contents or subscriptions change, the library might lose access to the materials. Another problem is that using library materials in your course makes it harder to share your low-cost course with instructors at other institutions because they might not have access to the same library databases and ebooks as you do. You’re solving the problem but only for your students, with your institutional access. The textbook savings goodness stays inside a walled garden. However, there are situations where using library content might be the best approach. This is especially true when it’s impossible to use an open equivalent for your course materials. For example, if you’re studying modern poetry then nearly all of your primary sources are under copyright. Another case would be when a course learning objective is to find and use research from the library. It’s also true that while there is much more great open content available today than ever before, there are still some areas where existing OERs don’t meet the learning objectives for a course. Talking to faculty about replacing expensive textbooks with trusted sources from the library can lead to conversations about open content. While library materials are not the same thing as open educational resources, they can be an important component in solving the problem of high textbook prices. So far it’s going well but I’m carefully going over your strategies to see if there are ways we can improve on what we’ve started and to streamline some of the steps. I love the idea of linking library e-books on the bookstore page since that is where many students start. That may not be an option for us since we use a third party vendor but I have met to discuss textbook affordability and student success with our bookstore manager (thanks to Steven Bell and his encouragement on OER lists) and he was open to partnering with the library in any way he could and it can’t hurt to ask. More doable for us may be creating a textbooks as ebooks in the library list on our library website. I really appreciate the examples you provided. Thanks again for the helpful post. Will do, thank you, Amy!